As trade between regions and nations gradually began to expand, some form of international trade would have been necessary. It is perhaps because of this primary reason that ultimately money among trading nations at least tended to merge toward a form of metallic system. The precious metals acting as a trading currency forced various standards of weight to emerge. Even the Bible refers to transactions taking place stating that the silver was “weighted.” From a linguistic perspective, much of our modern day words still reflect this link between money being weighted and transactions. For example, the terms “spend” and “expenditure” all come from the Latin “expendere” which means “to weigh”. The British “pound” as a monetary unit originated from the Roman monetary system where the “As” was a weight standard based upon 12 ounces equal to one pound. Throughout much of the Greek civilization, the first basic unit of money was the stater, meaning literally “balancer” or “weigher”. The later unit of weight that emerged on mainland Greece was the “drachma” meaning “handful” of grain with varying standards from city to city. The “talent” was a monetary unit was also a Greek unit of weight, about 60 pounds that was used even in terms of tribute under the Roman Empire. The importance of the cowrie shell as money in China is demonstrated by the pictograph that was adopted. In the Chinese written language, the word for “money” resembles a drawing of the cowrie shell itself. Communication between peoples is often the key to success. For example, although the United States became the melting pot of the world, all nationalities were forced to speak a common language, English, in order to fairly participate within the economy. As a result, you find Germans intermarried with Italians, Irish, French, and Greek and vice versa. Yet in Europe, the differences in language to this day highlight the different cultures between each nation of Europe and as such have been the primary cause for the maintenance of different monetary systems in each state. 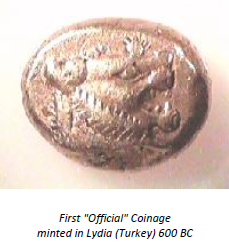 The birth of the standardization of the monetary system in western culture and the spread of coinage as an invention is greatly due to the history of Greece itself. The Heroic Age of the Greeks was the period of which Homer wrote. It was the era of Ulysess, Hector and Agamemnon. It was the saga of the Trojan War and legend of the beautiful Helen – the face that launched 1,000 ships. This was the height of the culture of Mycenae. This age of Heroes that has been handed down to us today came to an abrupt end not long after the fall of Troy. Mycenae crumbled following the death of Agamemnon. After the fall of Mycenae, we come to what is known as the first “dark age.” What is clear is that during this period the Greeks dispersed throughout the Mediterranean. Some have argued that the Heroic age was an economy highly dependent upon agriculture. It is then argued that droughts or perhaps a sharp decline in temperature may have seriously damaged the economy forcing many Greeks to seek new lands. Others claim that the land became exhausted and that the rotation of crops was not yet developed. Whatever the cause of the dark ages, Greeks certainly spread out across the known world. Therefore, when we come to the period of 700 B.C., the Greeks occupied Sicily, Greece, Asia Minor and some parts of Italy as well as portions of North Africa. Rome was not yet organized and the two major powers that threatened the Greeks were those of Persia and Carthage. In this age of widespread common Greek culture, the invention of a standardization of weights began to emerge from Asia Minor – modern day Turkey. It is clear that silver dominated the exchange of mainland Greece and much of the western colonies. However, gold in the natural alloy with silver, known as “electrum” formed the foundation of the monetary system in Asia Minor. 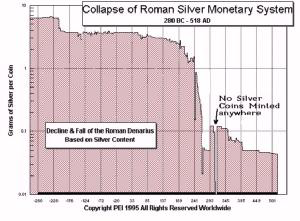 It was the ability to refine this natural alloy into nearly pure silver and gold in Asia Minor where we find the first beginnings of the bimetallic monetary system with gold providing the medium for exchange in large transactions and silver serving as the more common medium of exchange. Although there was a move toward the standardization of weights, there were at least several standards employed throughout the Greek world. Still, this new invention spread quickly throughout the known world at that time aided much by a common language and city-state pride. 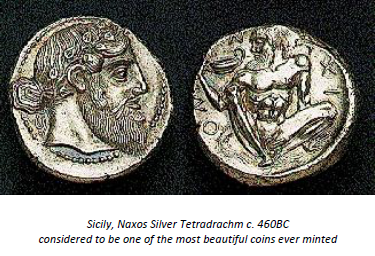 During the 6th century BC, city-states began to use coins as a symbol of prestige similar to where modern small island nations rushed to have their own national airlines even when they were not economically sensible. The city-states of ancient Greece took a similar pride in their coinage at first displaying the badge of the city or a local god who was deemed as their protector. By the fifth century, prosperity had arrived and the Greek city-states began to compete to produce the most beautiful coins ever made. Coins issued during this period are often the finest examples of Greek art in miniature form. As time passed, the weight standards finally began to merge based not on city pride, but on power. Athens emerged as the victor and savior of Greece in the battle against Persia. By 450 B.C., this exalted status of Athens brought immense power and with it the first world currency in western culture based upon the Attic weight standard. 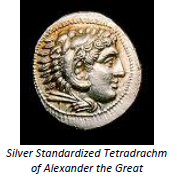 Alexander the Great also imposed not merely a weight standard on the known world of his day, but also standardization in design. The once great works of art that emerged by city-state competition fused into a unified design. However, it would be the Romans who would find even a greater use for coins than the Greeks – advertising! The Roman Empire initially adhered to the standardization of design imposed on the world by Alexander the Great. As the Roman Republic grew, so did the political activities within society. Families would complete to become the “moneyer” who would then have power over the minting of coins and their design for a certain political term of office. Coins of this period often boasted of great deeds relaying to some ancestor. The Republican tradition of prohibiting the likeness of any “living” person would be a practice followed by many republics that followed, including the United States. Toward the end of the first century BC, the Roman Republic fell through corruption of the state. This final collapse came with the civil war between Julius Caesar and Pompey the Great. It was during this period where the first “living” portraits of these men and others begin to appear. The reverse side of the coinage was used as advertising some great victory or event. Mark Antony went as far as to issue coinage specifically inscribed for each of his legions leading into the battle against Octavian. During the imperial era, Romans used the reverse side of their coins to announce everything from the opening of ports, the coliseum and the conquest of Judaea. 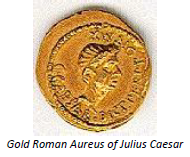 Another Roman tradition that still endures to this day is the issue of commemorative coins. The 1000th anniversary of Rome was celebrated by the issuing of coins to mark the occasion. Deaths of emperor’s wives and heirs to the thrown as well as former emperors were all commemorated on coins sometimes issued hundreds of years later. The Emperor Constantine the Great issued coins to celebrate the founding of his new capital city – Constantinople. The coinage throughout the centuries has also provided great insight into the economic history of humankind. The coinage itself has left behind a detailed record of man’s accomplishments as well as his trials and tribulations. There is no better record of inflation than that provided by the monetary history of the world and its legacy continues into modern time. The current penny as used in the United States and Britain is the direct descendant of the Roman denarius which became the denier, denaro and English penny during the middle ages still struck in silver. It would be the 18th century when the penny was finally reduced to copper and then reduced in size during the 1850s. During the 1980s, the American copper penny was further debased to mere zinc with copper plating. Indeed the history of inflation continues to unfold in modern time. Throughout the ages, the monetary system of the world has emerged from the desire to adorn ourselves with objects that we found attractive. That demand placed a higher value on a variety of objects and eventually gold as well. From jewelry to valued commodities, money provided the means through which trade prospered and with it civilization. The surviving relics of the past have formed the foundation upon which legend has been transformed into documented history. Indeed, the coinage of humankind through the ages has illuminates not merely the past, but continues to provide the footpath to the future.